We estimate that 20% of an online shop's annual turnover comes from Christmas sales. So get yourself ready to increase sales and be part of a market worth over 6 billion Euros (2010 figures, Fevad/Directpanel study). Put our 7 tips into action and see your seasonal sales soar into the stratosphere! Adorn your website in Christmas colours to create a festive atmosphere and make your visitors want to buy gifts for their loved ones. Peggy André, www.bagatelles.fr gift shop manager, says «Customers appreciate change and love the unique atmosphere during the festive period so ensure you give your website a special Christmassy design. If this isn't a possibility then you should send customers a message such as: "(shop name) wishes you a Merry Christmas.». Add baubles and tinsel so your customers can see that you have updated your website for Christmas and that your website's look changes to reflect the major events of the year.. Put your most popular products on your homepage so they have increased visibility. Make the most of the seasonal celebrations to update your product range with special Christmas items and reflect the current buying trends. You should change your product images on a regular basis if you use a slideshow. The photos should attract your customers' attention and encourage them to take a closer look at your products. Internet users always need inspiration when it comes to presents. You could create a "Christmas" tab on your shop and list your "gift ideas". List them by category (age, gender, price etc.) to help your customers find the perfect gift and thus increase your conversion rate. Offer your customers a gift wrapping service. This is very popular with consumers as it saves them time. We recommend gift bags as your customers can check the product on arrival before giving it as a gift. If a gift bag isn't suitable for the product then display photos of the gift wrapped items so the customer can see the final result. The manager of http://www.bagatelles.fr says you can even «put a small gift or Christmas card in each parcel for your customers». Take your time checking your product pages (descriptions, photos, links to basket, customer reviews, links to social networking sites etc.). Check out our blog article about product pages. Offer your customers promotional codes and free delivery for Christmas to increase your shop's conversion rate and boost sales. For information about when to use these promotions, please read our blog articles about delivery charges and discount codes. The immediate benefits of promotional codes for example are very popular with customers so avoid discount vouchers that need to be printed for use in store. «Promote the products you still have in stock that last minute buyers will grab after the rush between November 25th and December 18th.» souligne Peggy André. 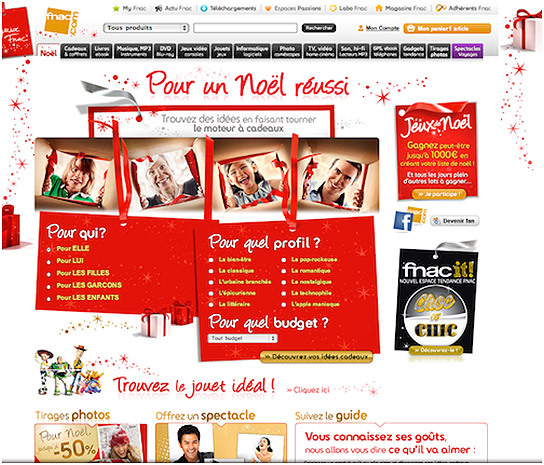 E-commerce websites usually start promoting their Christmas offers at the beginning of November. Peggy André suggests «sending a weekly or fortnightly newsletter from the beginning of November with your news, a promotional code, a surprise and gift ideas to encourage the most indecisive customers to buy from your website». Send gifts to your best customers to thank them for their loyalty (e.g. a promotional code or free delivery). Use their order history to suggest gift ideas that may be of interest to them. Highlight the benefits of buying on your website during the festive period. For example the customer can place their order in a few clicks at any time of day or night and their gift will be delivered on time. This avoids the stress of having to hunt down Christmas presents. If you have a telephone service then prepare to have 4 times more calls than usual and be ready to answer all of them. Make sure your customers know when the phone line is open by putting opening hours on your website. You should be available to answer last minute calls during the last week before Christmas until 10pm or 11pm. If you don't have a telephone service then get one. It will reassure your customers that they know where to go in case there is a problem. You could even «train someone in customer service to answer phone calls, emails and live chat» suggests Peggy André. Given that 20% of all Christmas gifts are returned to the shops, you should certainly display your returns policy on your website. During the festive season, delivery times are a headache for your customers as they worry that the presents won't arrive in time. Reassure your customers by displaying the delivery times on your website. Think about maximising your website's natural ranking if you haven't already. I would like to invite you to download the natural ranking white paper for free by PrestaShop (in partnership with the e-commerce blog) that will show you how to get your website in the top Google results. You can also set up a Google Adwords campaign for the holiday season. Your website will appear in Google sponsored links and thus become more visible. Increase your presence on platforms at Christmas time and display adverts on marketplaces such as eBay and Amazon. Ensure you have enough products in stock to avoid being out of stock. « Some suppliers have limited editions which means you can't replenish stock of these items. You should therefore ensure that you have enough stock a few weeks before Christmas especially if these items have been promoted in one of your newsletters or on your homepage » advises Peggy André. advises Peggy André. Make sure you have enough stock for the rush between November 25th and December 18th. You should also ensure that you have enough «packaging supplies for your orders: boxes, sellotape, bubble wrap, padding, wrapping paper etc.» warns Peggy André. Peggy André suggests providing a «next day delivery service for last minute shoppers so your sales continue up to and including December 23rd» for last minute orders. The workload increases significantly during the festive period. Be smart and «take on friends, family and anyone else you can find to help you pack your orders» Peggy André suggests, « make sure you train them beforehand so that they work efficiently ».